Computers are the wave of the present. And if revenues are any indication, David Turner, president of Turner & Associates, is riding the crest and in a big way. Last year, his computer firm grossed $1.7 million, placing it in the vanguard of new firms in the computer consulting industry. Turner, 43, a graduate of Tougaloo College, started the company in 1991 after working for several years as a computer programmer, analyst and consultant for various companies including General Motors and several aerospace firms. He later worked as a manager in the banking industry. "Downsizing in the banking industry is what prompted my thinking. Starting my own business would give me some control over my destiny," he says. 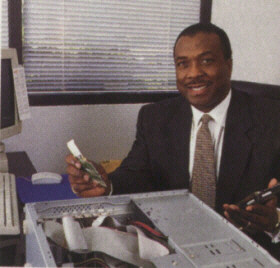 Turner first took a turn at controlling his destiny in 1989 when he and a business partner liquidated real estate to the tune of $100,000 a piece to start a computer consulting firm. A year later, when the pair realized they were incompatible as business partners, Turner decided to go it alone. He used $25,000 of his own savings to start Turner & Associates. Turner operates offices in Las Vegas and Chatsworth, California, with a 40-person staff of computer programmers, network engineers, quality assurance analysts and PC technicians who help provide customers with round-the-clock access to service. Turner also calls upon a network of independent consultants based in Los Angeles, Sacramento and San Diego. Turner's installation rates vary depending on the type of program and the programmer's level of expertise. Installation of Microsoft or Novell programs, for example, costs $25-$40 per hour, while Visual Basic and Cobal Languages could cost as much as $75-$100 an hour. In addition, the firm provides equipment, training, maintenance and temporary or permanent service personnel to clients, which include Sprint, Nevada Power, Home Savings of America, American Honda and Electronics Data Systems. "We're looking to boost our revenues to $2 million in 1998," Turner says. "And we plan to open another office in San Diego." David Delacalzada, director of information systems and services for Time Warner Cable in San Diego, says Turner has been batting close to a thousand with the people he sends to augment Delacalzada's staff. "He understands our technology needs, does the appropriate screening and sends the right people, which saves me a lot of time," says Delacalzada. It doesn't get any more bottom line than that.